Cinecastar is a newly formed partnership between two of the leading media and entertainment service providers in Australia. IPSTAR and Silver Trak Digital have combined to bring motion picture and cinema content delivery into the 21st Century, by joining the Silver Trak Digitals expertise in DCP and QC creation and management with the technology sophistication of IPSTAR’s aggregation system and satellite network distribution. Once connected exhibition content can be instantly received and downloaded unaffected by line bandwidths and network speeds. It is a “one-stop-shop” solution for today’s cinema and exhibitor industry. We are the Australian and New Zealand arm of Thaicom PLC, the largest Asia Pacific based satellite operator. We have 26 years of experience in broadcasting and multicasting content for multiple major network channels throughout Asia Pacific. In 2005 we launched the world’s first broadband dedicated High Throughput Satellite, IPSTAR-1. This is the largest satellite over Asia Pacific covering 14 countries. Since our Australia inception in 2003 we have connected 110,000 rural homes and businesses to broadband and provided Australia’s incumbent telco, Telstra, capacity for its enterprise and government services. We have provided the Australian Government’s National Broadband Network capacity for their satellite service and also provided them a managed service to connect end users. In addition, with our Orion brand we provide mission critical corporate services to the resource industry in remote mining and exploration locations where service reliability is crucial. Silver Trak Digital is a technology company providing content owners and media companies with innovative, software/cloud based media logistics and distribution services. Silver Trak Digital is trusted by the industry’s biggest names and is an important supplier to broadcast, media, production, distribution and corporate markets. Their experienced staff have a wealth of experience in versioning and compliance, content aggregation, media management and sales fulfilment, including DCP creation and management. With high skills levs and years of experience in the cinema industry, Silver Trak is able to provide exceptional support and service as we implement Cinecastar. What is the Cinecastar Content Distribution Network and how will cinemas receive content? It is an end-to-end IP platform satellite content delivery network for Australia and New Zealand to deliver predominately movie and trailer content to all cinemas. We will use the same KenCast technology used by the DCDC network to deliver movies and other content to 2,700 cinemas across the USA. Essentially, we can deliver any data you wish to send to cinemas. We will use our own satellite, dishes, modems and KenCast Equipment to transmit content from Sydney and Auckland to all cinemas across Australia and New Zealand. Why doesn’t Cinecastar use a terrestrial network or the Exhibitors existing Internet connection? What about the Australian Government’s National Broadband Network (NBN) and New Zealand’s Ultra-Fast Broadband – they’re supposed to be fast/cheap? The terrestrial networks in Australia and New Zealand (fibre, ADSL, wireless, etc. ), when attempting to utilise high speed file transfer software, are too slow as they are bottlenecked at most local telco cabinets and/or too expensive to send multiple large files (300GB+), or simply not available to all cinema locations. Additionally, even if it was possible, we do not want to be reliant on Exhibitors’ Internet connections due to the risk of poor or unknown service performance, unforeseen security issues and outages. We also understand that Exhibitors do not want to share their Internet connectivity for this purpose as they require it for their day-to-day operations. Simply put, it is not physically, and economically possible in the majority of locations to get a service with enough reliable broadband to perform the task required. Will the service be better value than the existing solution? Is it reliable? We own and operate the satellite so we can rapidly scale bandwidth as required to meet demand during busier periods which ensures your content is always delivered on time. You are dealing directly with a satellite operator which keeps the costs lower. There is more bandwidth on our High Throughput Satellite compared to conventional satellites which equates to a lower cost for bandwidth. Satellite distribution is more economic because we can multicast (or broadcast) one file to multiple locations using the same bandwidth as opposed to buying separate terrestrial broadband connections for every cinema site. Our service uses KenCast which is a proven and reliable solution used by the DCDC network in the USA to securely and efficiently deliver content via satellite to 2,700 cinemas. Silver Trak Digital’s many years’ experience in creating DCPs and managing DCP distribution including KDM management. The service is using our highly secure satellite and is not reliant on the service performance or limitations of Exhibitors’ internet connections. This ensures reliability of service and secure delivery. IPSTAR’s service is a dedicated end-to-end solution from the satellite in orbit down to the earth station that connects the satellite to our data centres in Sydney and Auckland where your content is ingested. There will be a guaranteed lower total cost and the service provides the most secure, scalable and future proof solution. How much does the equipment cost and what is it? Nothing, IPSTAR will invest in all central headend and cinema site equipment including installation and ongoing costs. Aside from the satellite network (satellite and cinema dishes/modems), we have KenCast central servers where content is ingested. At each cinema site is a KenCast client server with storage that receives the content and pushes it to the TMS as per your booking schedule. Our solution is using the same equipment that DCDC has used successfully in the USA since 2013 to distribute movie content to 2,700 cinemas and is also used by the US and British military. How long will content be kept on the cinema client server? We will hold the content on the cinema client server for 6 weeks after delivery of content to TMS. It will then be automatically deleted. What about physical promotional materials? E.g. Standees, posters, etc. Where do Distributors send them? How will cinemas receive physical promotional materials? Cinecastar can accommodate the delivery of all marketing materials in parallel to your feature and trailer deliveries. We have a large courier network that works with some of the current exhibitor collection networks. Our facilities can also accommodate large duplication processing and marketing deliverables. What if some cinemas are not connected at the beginning of service? Our service provides the Distributor a one-stop-shop. We aim to have a minimum 50 cinemas connected before commercial launch. For cinemas that are not immediately connected, we currently provide some 500+ cinema locations with physical deliveries on a daily basis. For cinemas yet to be connected during the roll out, we can still provide our current physical delivery service to these locations. During the transition phase, unconnected cinemas can utilise courier services, as they do now, to collect and return the HDDs until they are connected. Our one-stop-shop with HDD delivery allows your content delivery through one supplier. What happens if a cinema’s site equipment fails? Silver Trak’s capability includes the duplication and delivery of HDDs direct to the affected site at no extra cost to any party. In parallel, we will arrange a service call to fix the site issue. We maintain an adequate local inventory of spare parts to ensure timely rectification. Can Cinecastar provide encryption key services and sequencing for movies and trailers? Yes, our one-stop-shop can offer a full suite of services around DCP creation including KDM creation, support and management. Silver Trak Digital, are trusted suppliers within the broadcast, media, production and distribution industries. What are the key milestones leading up to the service launch? Cinecastar understands that Distributors renew their Agreements with their current DCP HDD distributor in December every year for the following year. Due to this we have an aggressive engagement and rollout schedule to ensure you do not have to be locked in for a further 12 months. 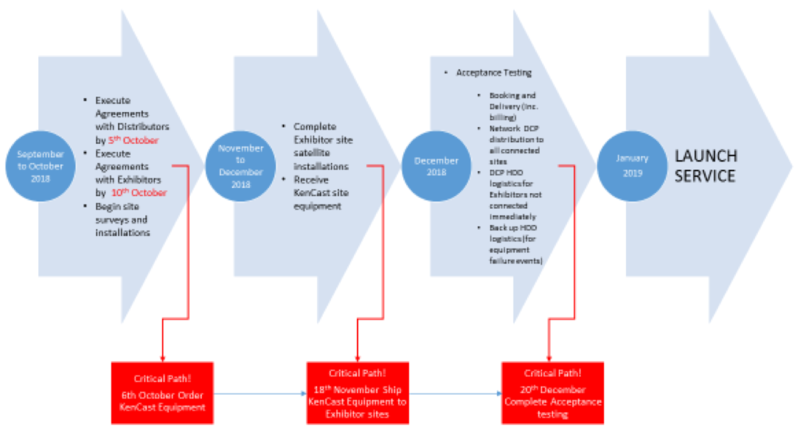 We also need to order KenCast equipment and provide them with sufficient lead time to deliver thus ensuring we can have our service ready for January 2019. The timeline below highlights the key events that need to occur leading up to a January launch. We’ve heard this all before. We want to take a “wait and see” approach. We don’t want to be first. The launch of this service is reliant on Distributors signing agreements to allow Cinecastar to distribute content. The Exhibitors are fully committed to automating the transmission, scheduling and playback of all content including pre-show, trailers and feature film content and will agree to installations once there are agreements with Distributors for content to be delivered. We also need commitment from Distributors before we invest AUD$2.7M+ on equipment and installation. We are concerned that the service won’t work, hence our “wait and see” approach and avoiding being first. We have completed a successful technology trial with 12 sites across Australia and New Zealand during which we simulated a high traffic event (e.g. Christmas) as per our Test Transmission Report. Since 2013, the DCDC network has used the same KenCast technology to successfully deliver movie content via satellite to 2,700 cinemas across the USA. However, we understand your concern, which is why we will perform an acceptance test on our one-stop-shop service. The test will involve electronic delivery, HDD delivery for sites not connected initially and backup delivery (for site failures) before expecting you to send new content. The acceptance test will involve Distributors and Exhibitors to ensure all parties are confident that the service works before its commencement.